It could have been a sign of bad things to come. Even before the performance had begun, tensions were running high amongst the crowd at Scape. 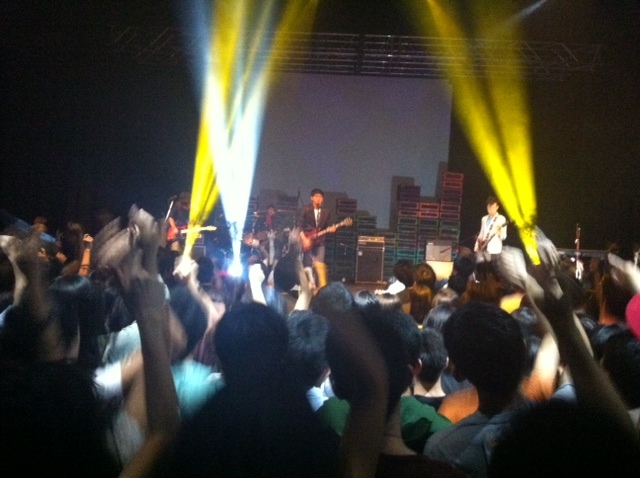 The ground floor of Scape was packed with an eager audience, revved up for the rock event of the year. Yet, as the time trickled past the designated starting time of 7pm and the doors to the warehouse remained firmly shut, murmurs of irritation and annoyance were rampant amongst the crowd, amplified only by the stifling heat from the huge crowd. Pleas by the ushers for the crowd to move away from the entrance went unheeded, and when news leaked that a technical error had caused a delay, more complaints went up. Rock could have managed the crowd better, with retractable barriers as queue lines instead of allowing the audience to converge into an unrestrained mass. The absence of queue lines also meant that many latecomers were able to simply push their way to the front, displacing those who had made the effort to arrive early in order to secure good spots in the free-standing arena. The delay brought out the uglier side in some Rafflesians, as many displayed poor queuing etiquette, and brief scuffles and angry shouts even ensued when the doors were finally opened. However, as many in the audience would later attest to, Rockout 2013 was well worth the wait. Multi coloured strobe lights and theatrical smoke added to the atmosphere; each performance was accompanied by a mini laser-light show synchronised to the beat of the music. Combined with the theatrical fog, the effects were stunning. Before the start of each performance, a short video clip introducing the band performing was screened with screen time allotted to every band member – a commendable idea, considering the fact that onstage, most of the attention is given to the lead singer instead of the band members. Lighting and technical did a ‘sound’ job! Year 5 band Army of None was first to take the stage and they were welcomed enthusiastically by the hyped-up audience. Their performance was off to a muted start, however, as their first song, Charlie Brown by Coldplay, was unfamiliar amongst audience members. Nonetheless, the band eventually got the crowd going with their last song, Radioactive by Imagine Dragons. The excellent coordination among the members proved Army of None to be a promising band and amazing first act that left the audience craving for more. Army of None’s lead singer, Jonathan Boey, delivering a spirited performance to the crowd. 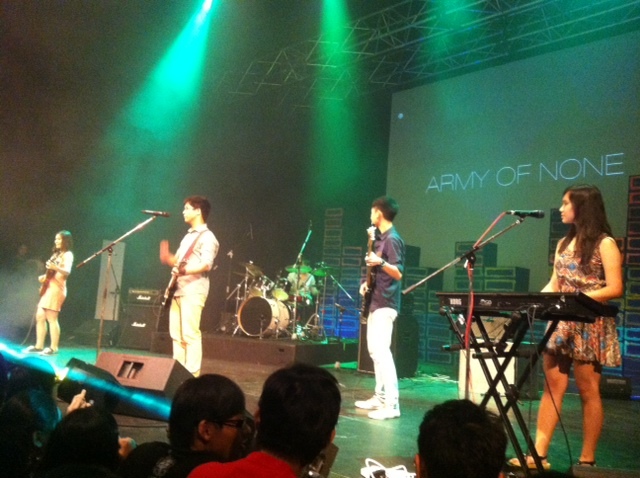 Army of None opens the show with a bang! 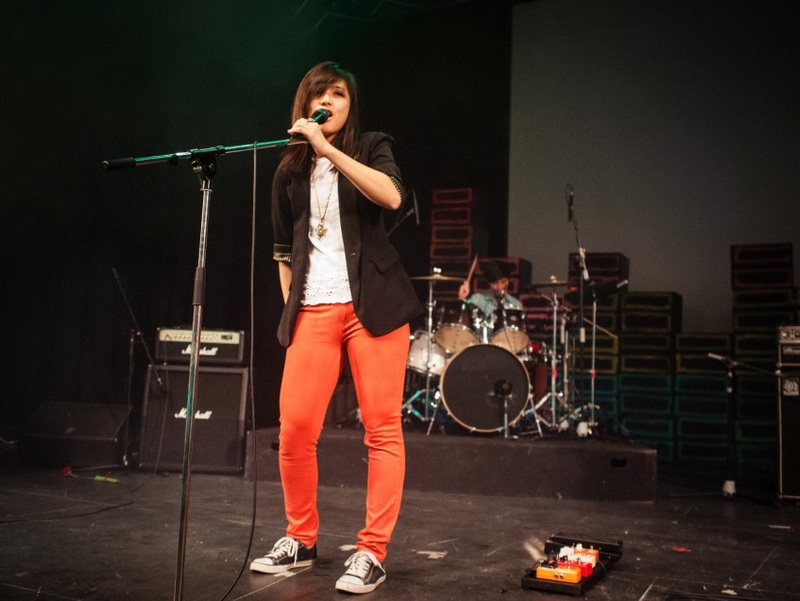 Possum Parade, another Year 5 band, was next in the line-up, and the audience was treated to the crisp and well-controlled vocals of Rachel Lim as she and her band rocked out to popular tunes such as Little Talks by Monsters and Men and Little Lion Man by Mumford and Sons. The energy in the audience was further amped up by the brilliant showing from Possum Parade, and at this point, several audience members had started crowd-surfing, adding another significant rock concert element to the night. Possum Parade’s Rachel Lim looked stunning in her simple yet striking outfit. The talented members of Possum Parade bringing the house down. The next band to take the stage was the very first Year 6 band of the night, The Fifth Degree. Despite some technical difficulties with the microphones, the band was spontaneous and engaging, thoroughly entertaining the audience with their set, which included heavy-bass songs such as Light Up The Sky by Yellowcard and Damned If I Do Ya by All Time Low. Lead singer Hansel Tantohari impressed not only with his clear, edgy vocals but also with his charismatic stage presence. Eventually, the band ended off their energetic performance with a slower piece, playing In My Place by Coldplay. The chemistry among the members was evident, showing all the signs of a well-seasoned band at ease on stage and in front of a large audience. 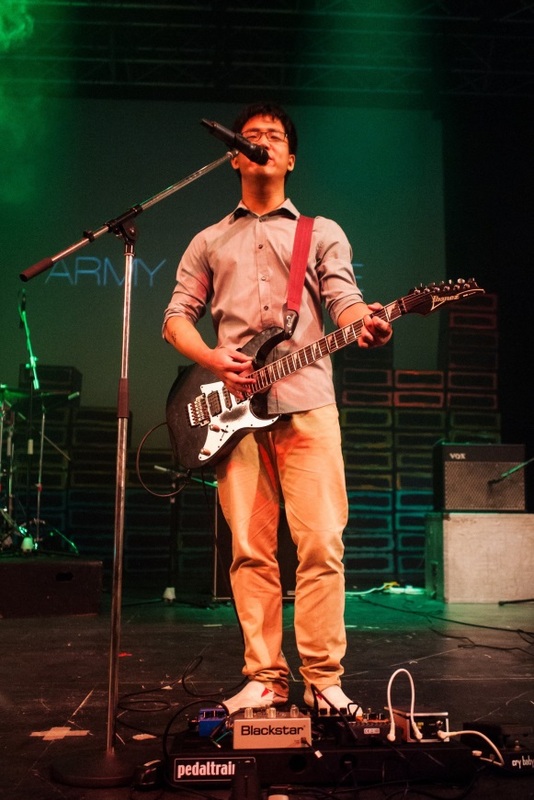 The band’s guitarist, Jonathan Kit, shows off some impressive guitar chops. 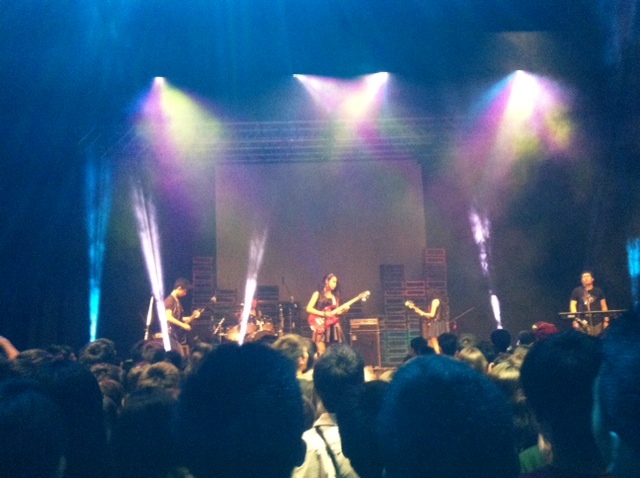 The Fifth Degree earning well-deserved applause that night for their airtight performance! 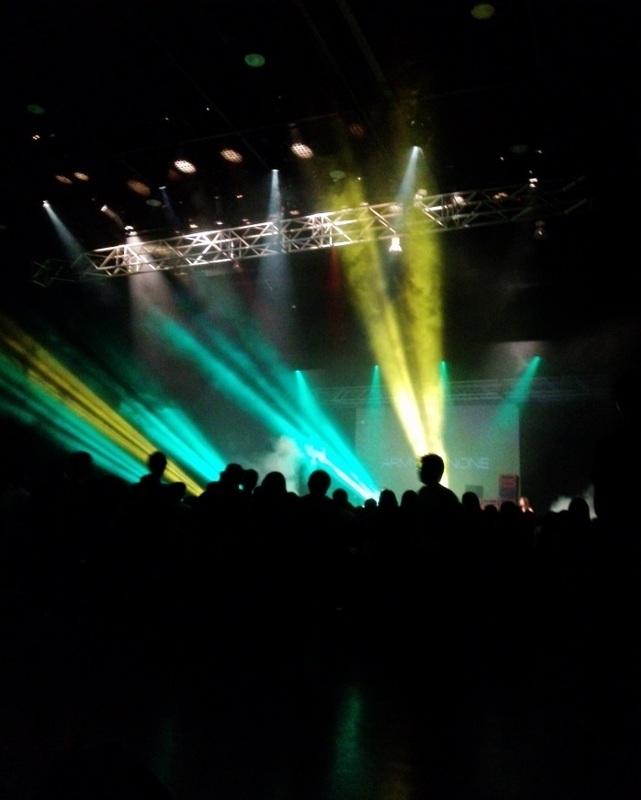 After the intermission, there was a palpable change in atmosphere, as a more intimate stage setting was used for the later segment of the concert. 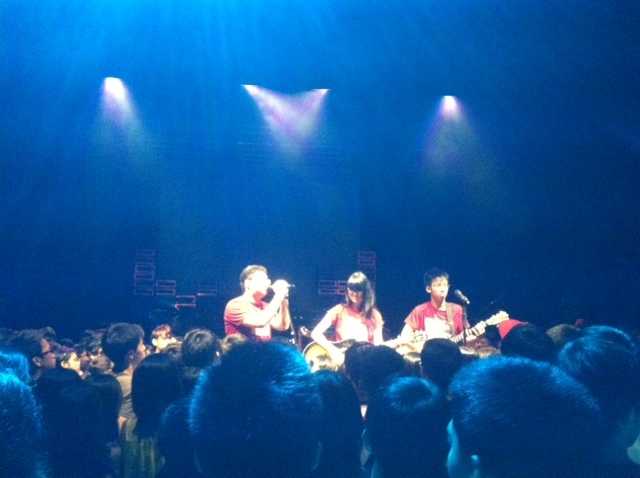 William BJ and Stephanie Yeap, accompanied by fellow band members providing instrumental back-up, delivered a heartfelt and convincing acoustic performance of Therapy by All Time Low. 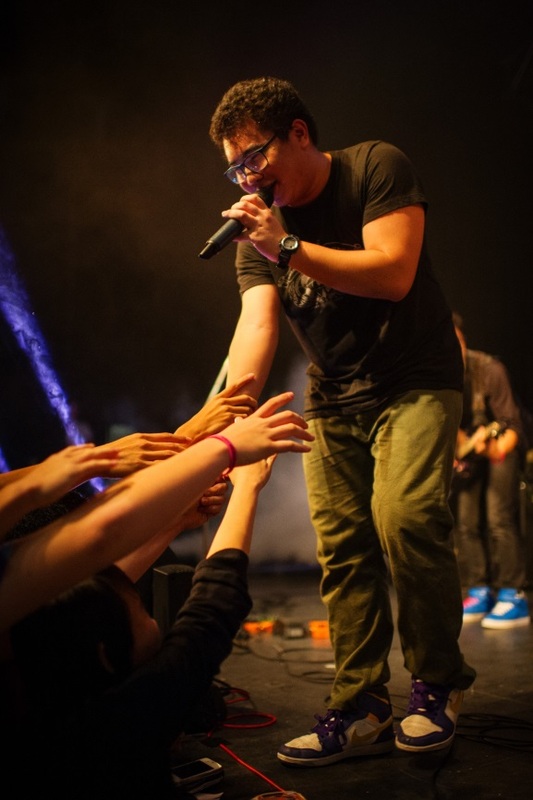 Hansel, accompanied by Nicholas Neo on the keyboard, serenaded the moshers with a sincere rendition of John Mayer’s hit song Daughters and warmed the hearts of many. 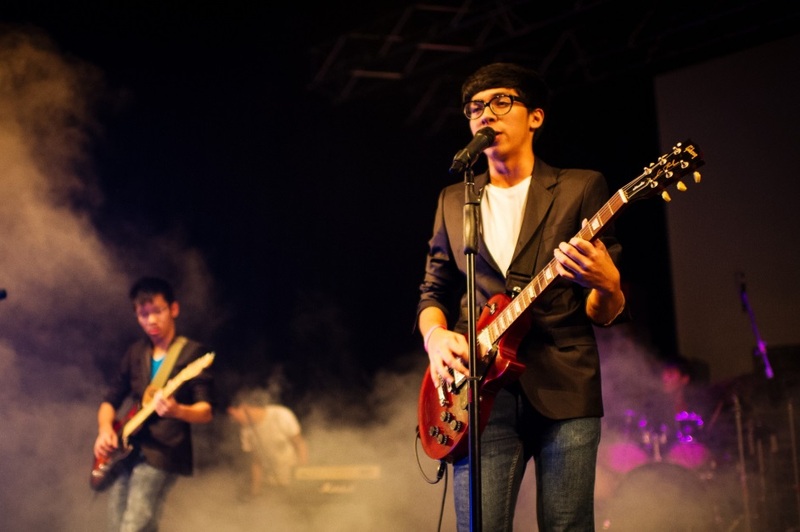 Jonathan Lee, supported by his band members, belted out his cover of Radiohead’s High and Dry. His husky powerhouse vocals raised goosebumps and left the audience blown away by his prowess. Rounding up the acoustic segment was Jonathan Kit as lead vocalist and Ernest Tan on the cajon with an earnest rendition of Live High by Jason Mraz. Hansel croons to the soulful tune of a classic John Mayer melody. Jonathan Lee and his band deliver an emotional rendition of High and Dry, leaving the audience spell-bound. With the conclusion of the acoustic segment, After Indigo took command of the stage with a shift back to the high-octane performances that preceded the acoustic segment. 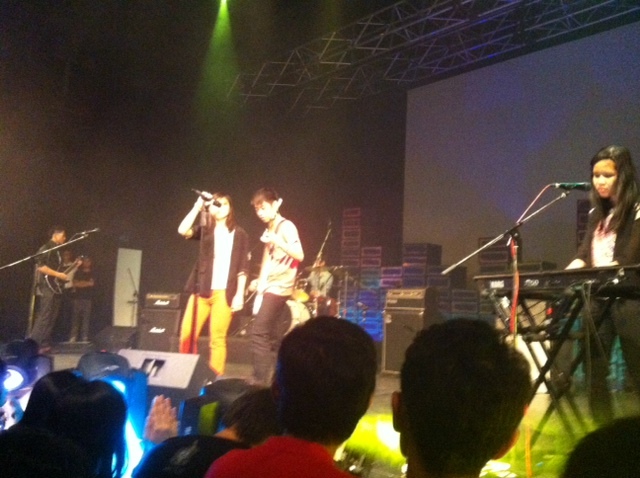 A band familiar with performing in front of large audiences, After Indigo had performed at this year’s Like A R!ot as well as various other concerts. With technical precision down to a pat, the band was noteworthy for their combination of powerhouse vocals and electrifying instrumental sound. One of the most memorable moments was when the audience was left dazzled by Stephanie Yeap’s versatile vocal range as she belted out the chorus of All I Wanted by Paramore. 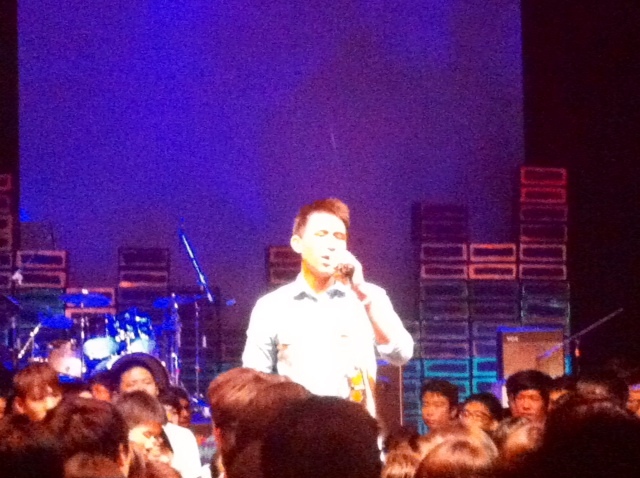 Jonathan Lee reaches out to an ecstatic audience. 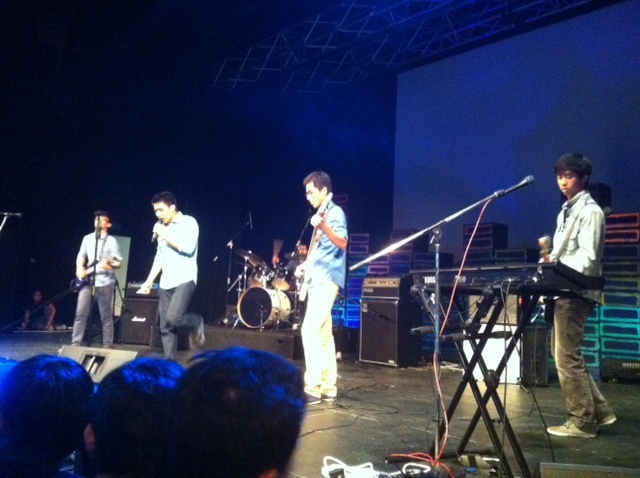 After Indigo proved their mettle in a truly dynamic performance. The last band to make their appearance was Eclectic Theatrics. Even after two hours of screaming themselves hoarse, the indefatigable audience still managed to give the band members a boisterous welcome. The band opened their set with Fall Out Boy’s old school hit, Dance, Dance, which proved to be insanely popular with the many Fall Out Boy fans among the audience. A spirited delivery of Closer To The Edge by 30 Seconds To Mars followed – it was definitely satisfying to shout ‘No! No! No! No!’ while pumping our fists up in the air during the song. All inhibitions were left behind as the audience let loose in the mosh pit; jumping, fist pumping and even some air guitar action was spotted! 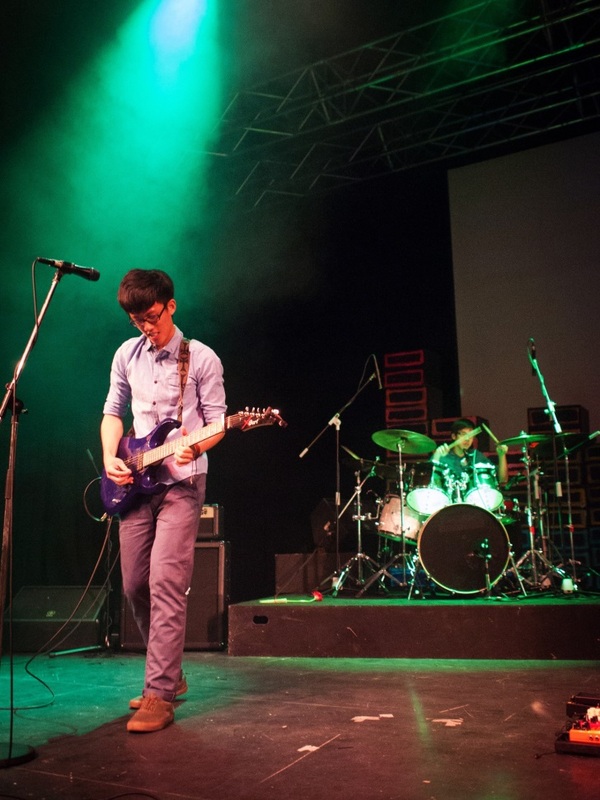 Eclectic Theatrics held nothing back in a thrilling performance marking the end of their Rock experience as a band. Chia Yaim Chong engages the audience with his charming guitar medleys. Clearly, the audience was not about to leave the concert without an encore performance. The Year 6 bands came on stage one last time to perform for the insatiable crowd of screaming fans in an unforgettable final farewell. The Year 6s seemed determined to go out not with a fizzle, but with a bang. In an emotional conclusion to the encore performances, the chairs of Raffles Rock, Chia Yaim Chong and Stephanie Yeap, thanked the audience for their passionate responses and the Year 6 batch of Rock for taking the journey together. Darren Tan’s supportive fans and friends holding up creative and highly amusing banners! 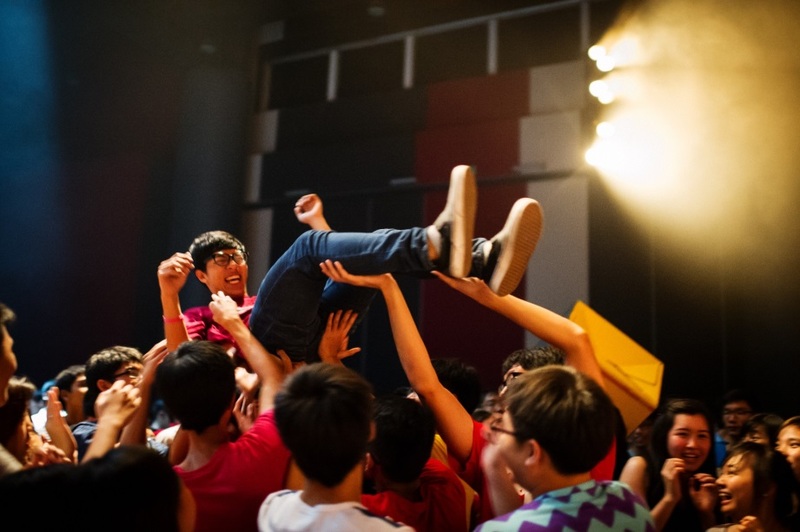 A candid shot of William getting crowd-surfed by the moshers! 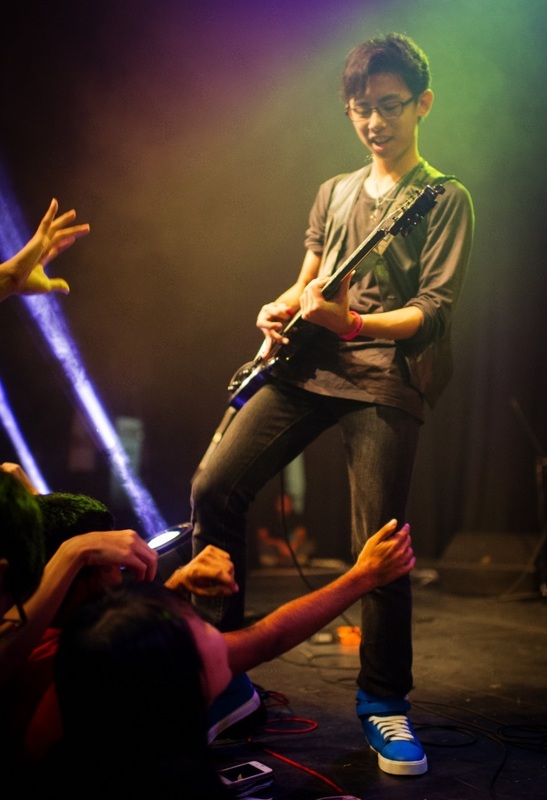 Performing to a sold out crowd at the Scape warehouse on the last day of the school term, Rockout 2013 was a resounding success that drew lusty roars of approval from the audience after every performance and had them calling for encore after encore. With a seductive mix of pop, rock and funk, the hefty three hour set of classic hits and current chart toppers was a definite win with the tireless audience who cheered their friends on with all the fist pumping and cat calling appropriate to a rock concert. 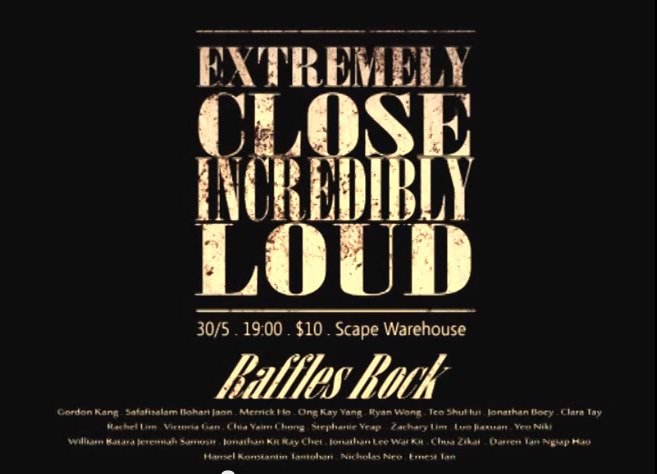 Well done, Raffles Rock, and with this final word of congratulations – ROCK ON! Hi! Do you guys have video recordings to the performances? :) Thanks in advance!